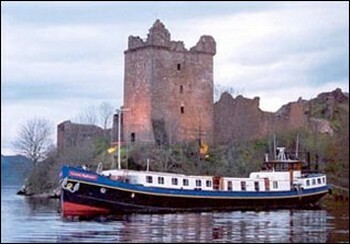 Scotland luxury cruises offer you the opportunity to do just that.. 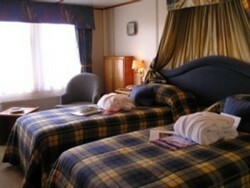 The Hebridean Princess carries just 49 guests and has a dedicated crew of 38. With 30 spacious, beautifully appointed cabins, this is The Way to see Scotland's ethereal Hebridean coast. The Outer Hebrides are off the Western coast of Scotland, far removed from the hustle and bustle of everyday life..
On this particular ship, you will not only rediscover tranquility, ..but also enjoy fine dining, and the best wine and service you can imagine.. The Hebridean Princess sets sail from Oban March to mid-November. Not only can you luxuriate aboard ship, but you can also enjoy guided walks in some of the most remote and beatiful areas of Scotland. After enjoying all the fine food, you can work out in her gym, or borrow some fishing tackle or a bicycle when you get to your destination.. 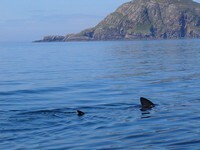 It's perfectly possible to see a basking shark while you're out cruising.. 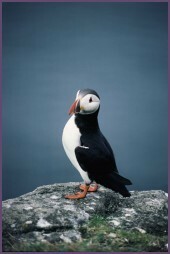 The Puffin, the bird with the wonderful personality! 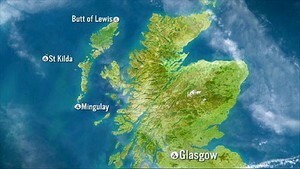 The other intriguing way to see Scotlands lochs, rivers and waterways is by barge. 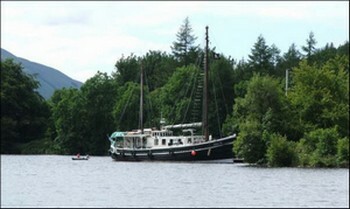 This particular barge is smaller, accommodating only 8 passengers. It will take you to many historic and scenic spots some of which include Cawdor Castle (home to MacBeth), Glencoe, (where the infamous feud between the Campbells and the McDonalds took place), the battlefield of Culloden, and moors overnight at the 13th century Urquart Castle. 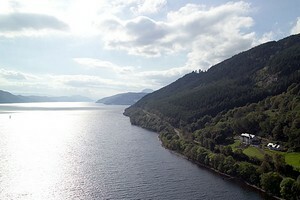 It also cruises Loch Ness and the Caledonian Canal where you can see wildlife and more enchanting Scottish Scenery. 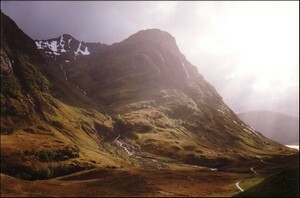 This is Glencoe in early summer..
For more information about this barge visit Go.Barging.com (Scotland).